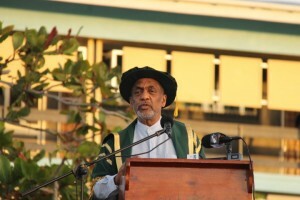 Dr. Vincent Adams addressing the 50th Convocation of the University of Guyana on November 12, 2016. A University of Guyana (UG) graduate, who admittedly migrated to the United States (US) and eventually rose to a senior official of that country’s Department of Energy (DOE), on Saturday urged graduates to remain and build Guyana because it is destined to become a prosperous nation , even as a number of developed nations frown on foreigners. “At the risk of sounding somewhat hypocritical, I would urge that you stay home in Guyana to take advantage of the opportunities that I foresee on the horizon,” Dr. Vincent Adams, currently Deputy Manager of the DOE’s cleanup efforts at two gaseous diffusion plant sites Ohio and Kentucky, told UG’s 50th Convocation at the Turkeyen Campus, Greater Georgetown. A total of 1,628 students graduated with masters and bachelor’s degrees, associate degrees, diplomas and certificates. One notable milestone of the 50th Convocation was the graduation of the first batch of students from four new programmes. Six students were received Master’s Degree in Internal Medicine/Infectious Diseases, six in Master’s Degree in Public Health and three the Bachelor of Science in Medical Rehabilitation and nine, including UG staffers from the Facilities Maintenance Division, received the Diploma in Industrial Engineering. UG, however, singled out visually impaired student, Ganesh Mithra Singh, for the outstanding achievement of graduating with a Degree in Social Work. 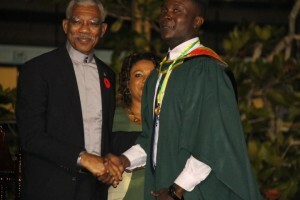 Kibwey Peterkin received the President’s Medal from President David Granger for being best graduating Bachelor’s Degree student from the Faculty of Health Sciences. Kibwey Peterkin received the President’s Medal for the best graduating Bachelor’s Degree student from the Faculty of Health Sciences and the Prime Minister’s Award for the best graduating student in the School of Medicine. Adams said another incentive for UG graduates to stay in their homeland is the increasing xenophobia that has emerged in North America and Europe. “Notwithstanding the great opportunities I see ahead for your future in Guyana, the times have changed gravely since my generation left these shores for greener pastures. And if you have been following the elections in the USA and Europe, for example, you should understand what I mean. We are not welcomed like we used to be,” he said. US President-elect, Donald Trump has, for instance, called for the removal of millions of undocumented immigrants and making it virtually impossible for offspring of foreigners to become American citizens. Across in the United Kingdom, plans are afoot to clamp down on the ease with which student visas are granted. The DOE official, who is a Senior Executive Services officer, said ExxonMobil’s recent discovery of commercial quantities of oil offshore Guyana, is also a good reason for not migrating. “Guyana now has the potential to become one of, if not the richest country on the planet but you are the ones with the tools to lead the way in making this a reality. The discovery of oil is a game-changer in a big way towards this reality but it is just the start of making this country an economic power in the world, but this is not about oil alone,” he said. Commercial oil production is scheduled to begin in 2021. Adams credited his alma mater with giving him the foundation to upward mobility in civil, hydrology, petroleum and geological, and environmental engineering. Adams told the graduates that their attendance at UG was not just about getting grades but gearing them to become innovative and independent thinkers who are flexible. He urged them to be passionate and focus on short term goals. “Be micro-ambitious! Again, do what you can control and the one thing you can control is hard work and believe me you don’t have to be smarter than the next person. All you have to do is to be willing to work harder than the next person. Your rise and accomplishment will take care of themselves. You get what you put in,” he said. The DOE official further suggested that the graduates must be humble and willing to learn as well find appropriate ways to respond to disappointments, failures and setbacks.